When this photo was taken in 1990 the Zenith-Godley Co., home of Cremoland Butter, were probably fairly recent arrivals. 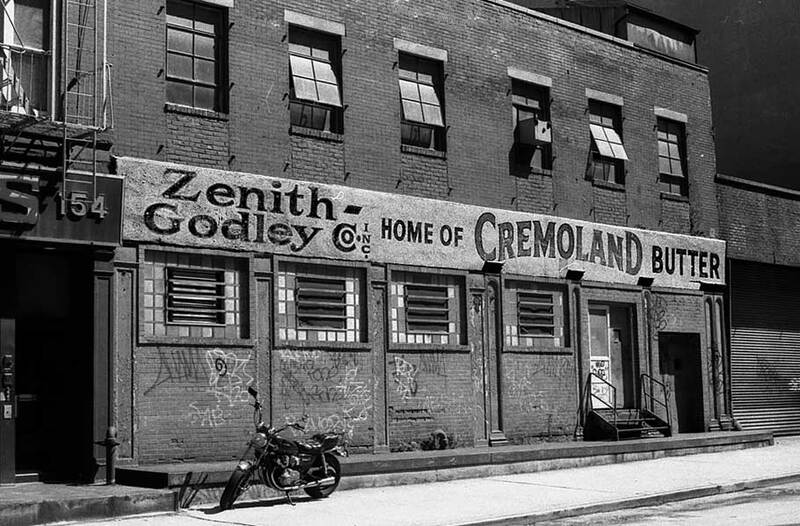 The Manhattan telephone directory did not list them at this address until 1996, and their address for many years earlier had been a block away at 171 and 176 Duane St. Also, Zenith-Godley itself had a long history (somewhat more than 150 years!) of predecessor companies in the butter and egg business. Their earliest ancestor seems to have been Matthias Enyard, oysterman, listed in Longworth's New York City Directory for 1827-28. A few years later, in 1831-32, Longworth listed John M. Enyard, oysterhouse, at 43 Hudson St. John M. Enyard was followed by Isaac S. Enyard (1825-1921). Isaac S. Enyard's provisions business was located at 189 Washington St. in the Doggett city directory dated 1846-47. Isaac S. Enyard enjoyed an extremely long career in the provisions / butter and egg business. He was in business for himself from 1846 to 1851. Then in 1851 he took as a partner John B. Seltzer. They were Enyard & Seltzer from 1851 to 1876. Then Enyard was alone again until 1884 when his new partner was David Bain (ca.1835-1892). Their business, Enyard & Bain, was located at 188 Chambers St. from 1884 to 1892. On Bain's death in 1892 Enyard took as a new partner Grandin F. Godley (ca.1853-1912), and the company became Enyard & Godley. On his death in 1912 Grandin Godley was replaced by his nephew, Augustus Pearce Godley (1877-1953), and the business continued as Enyard & Godley. Some of this later history was recounted in this notice that appeared in the trade journal, The Egg Reporter, vol. XVII, no. 17, 20 March 1912, "The recent death of G. F. Godley at his home in Englewood, N. J., causes universal regret. Mr. Godley was recently operated upon for gall stones, in connection with which complications of a very serious nature were discovered. Following the operation pneumonia set in, and within 24 hours thereafter Mr. Godley's life had gone out. The funeral was held from the home in Englewood, N. J., and was attended by nearly a half hundred members of the butter and egg trade of New York. Burial was at Easton, Pa. Mr. Godley was born at Spring Mills, N. J., 59 years ago. His early life was spent on a farm. When but a young man we [sic] went to New York and not long thereafter found employment with William H. Duckworth, than a prominent receiver of butter and eggs. Young Godley was a business fellow, interested in his work and soon acquired knowledge of the butter and egg business. In 1892, on the death of Mr. Bain, he became the partner of Isaac S. Enyard, the firm name being Enyard & Godley. They were then located on Washington street, removing later to 88 Warren street, still later to 311, and a few years ago into the fine store at 171 Duane street. Mr. Godley was active in the Mercantile Exchange and was looked upon as one of the leading and most reliable merchants in New York. The business of Enyard and Godley will be continued without interruption under the active management of A. Pierce Godley, a nephew of G. F. Godley, who has been with the firm for a number of years and has a wide acquaintance in the trade." This ad for Enyard & Godley appeared in the New York Produce Review and American Creamery, vol. 50, no. 12, 21 July 1906. In 1906 Enyard & Godley claimed "75 years in The New York Market." This would put their establishment at 1831. As noted, some of the Enyard predecessors actually seem to begin slightly earlier than 1831. This short notice regarding Isaac S. Enyard appeared in the New York Times, 3 Dec. 1921, "Isaac S. Enyard, the oldest member of the New York Mercantile Exchange, died yesterday at his home in Plainfield, N. J., aged 96. Until three years ago, he attended to his business as President of the firm of Enyard & Godley, 171 Duane Street, this city." Enyard & Godley survived until 1930, when they merged with the Zenith Butter & Egg Co. to form the Zenith-Godley Co. inscribed on the sign above. The Zenith Butter & Egg Co. was formed in the early 1900s. Trow's Copartnership Directory for 1909 listed officers as Edward C. Donnelly, pres. ; John McClay Jr., sec. and A. Pearce Godley, treas. John McClay Jr. (1885-1973) was born in Paisley, Scotland, 18 May 1885, immigrated to the U. S. in 1887, and died in Tenafly, New Jersey, 1 Dec. 1973. He was an officer at Zenith Butter & Egg and Zenith-Godley Co. from their inceptions until 1951. Another important figure at Zenith-Godley was Frank Wardell Winters (1879-1953). Born 6 Sept. 1879 at Slate Hill, Orange County, New York, Frank W. Winters started with Enyard & Godley in April, 1904. He was listed in the Polk New York City Directories as secretary at Enyard & Godley and at Zenith-Godley, 1915 through 1933/34, and registered for the World War II draft in 1942 when employed at Zenith-Godley, 176 Duane St. The following obituary for Frank W. Winters appeared in the American Egg and Poultry Review, vol. 15, no. 10, October, 1953, page 16, "Frank W. Winters former vice-president of the 108-year-old firm of Zenith-Godley Co., Inc., of 176 Duane Street, New York, died on Tuesday afternoon, September 29, in Beekman Street Hospital following a sudden illness. His age was 74. His home was at 25 Hillside Ave., Allendale, N. J. Mr. Winters was suddenly struck with a heart attack while preparing to enter the New York Mercantile Exchange trading floor during the morning Call. He was promptly removed to the hospital, where he succumbed a few hours later. Surviving are his wife, Mrs. Alice L. Winters; one son, L. Earle Winters, vice-president of Zenith-Godley Co., and a granddaughter, Learle Winters. Funeral services were held Saturday, October 3 at Van Emburgh Funeral Parlor, Ridgewood, N. J. Interment followed in Washington Park Memorial Cemetery, Paramus, N. J. Frank Wardell Winters was one of the most highly respected veterans of the New York City egg business, and long had played a leading though publicly inconspicuous part in its affairs. Joining the New York Mercantile Exchange in 1915 he devoted much of his time and energies to its functioning, serving a long consecutive term as its treasurer. Always among those in the forefront in developing sound and orderly practices, Mr. Winters leaves an imprint on the local scene which cannot be erased. His kindly humor, staunch integrity, careful judgment and retiring but fully recognizable personality will be sorely missed by his host of friends and associates in the city and throughout the western and eastern poultry belts. Born Sept. 6, 1879 at Slate Hill, Orange County, New York, Mr. Winters was moved to New Jersey the following spring when his family took up residence in the neighboring state. He received his initial education in public schools, and passed his teacher's examination at Newton in June 1899. Following 6 years of teaching in Sussex County schools and in Newton Business College, young Winters came to New York in March, 1904 to launch a career in the local egg and poultry trade which extended over almost five decades. Starting with the old firm of Enyard & Godley in April 1904, Mr. Winters assumed positions of increasing importance as the years passed. He became secretary of the firm in December 1912, with A. Pearce Godley as president and Peter C. Ronner as treasurer, and took over managership of the egg department in 1915. When in 1930 Enyard & Godley merged with Zenith Butter & Egg Co. to form the present Zenith-Godley Co., Inc., Frank Winters continued as secretary and manager of the egg division, and on the death in 1940 of Mr. Ronner, he became vice-president of the concern. In recent years he had withdrawn from active participation in the firm, but he maintained frequent contacts with its affairs and with his fellow Exchange members." This ad for Zenith Butter & Egg Co. appeared in the trade journal, Butter Cheese & Egg Journal, 17 May 1922. This ad for Zenith-Goldley appeared in the American Egg & Poultry Review, October 1953. That they were 108 years old and founded in 1845 seems to refer back to Isaac Enyard who was in the butter and egg business by 1846.